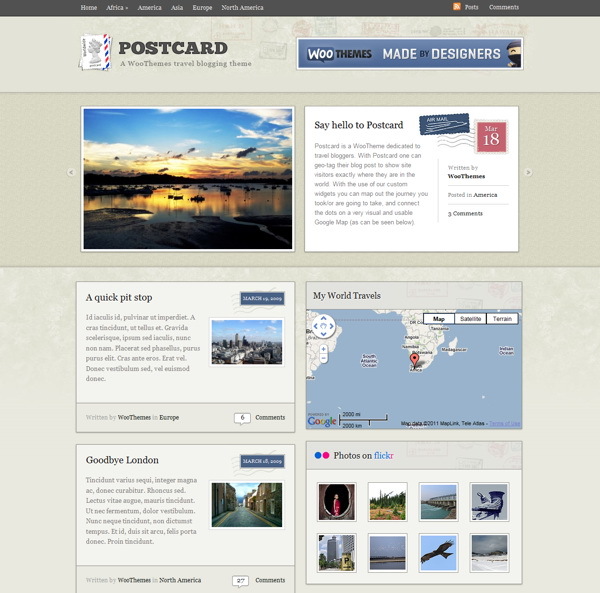 Postcard is a beautiful travel-blogging theme with neat Google Maps integration allowing you to geo-tag posts with locations and display your recent travels on widgetized maps. Its packed full of all the functionality a traveler needs to publish news and photos for friends and family back home. A custom home page featured scroller to highlight specifically tagged posts and present them uniquely – looking like the front and back of a postcard. Google Maps integration for geo-tagging of posts, with a custom map panel for your blog post editor and journey planning widgets for usage on the home page. Other Custom Woo Widgets for use in the 3 widgetized home page zones, and 1 generic site sidebar – e.g. Twitter feeds and Flickr photo streams. A category-based image gallery template that groups photos published in posts according to categories, and displays each category’s photos, minus the post content using neat AJAX trickery and ThickBox for image pop-ups. 9 alternate styles ranging from a ‘minimal’ blank canvas through to an ‘airmail envelope’ style, allowing for its usage to truly be limitless and it’s appeal to reach further than just travel bloggers. All our themes now include SEO options to help propel your site’s search engine ranking. Making simple changes without editing code, like adding your own logo, changing to an alternate color style, adding Google Analytics code, couldn’t be easier with the back-end theme options panel. The theme is compatible with all the modern web browsers like Firefox, Safari, Chrome and Internet Explorer. There is an image resizer script built into the theme framework to automatically scales your post images for pixel perfect display in our templates. No need to upload new cropped images when re-designing your website. It comes packaged with a .po file for easy WordPress theme translations into your desired language – editing one neat little file without hunting down text in the theme templates.